Example. Every time I reached into one particular cabinet, I'd see my favorite crackers, Triscuit Thin Crisps, sitting there, taunting me. And I'd successfully ignore them. And then I'd often watch Steve come along and proceed to eat them. And they would sound crunchy, and salty, and tasty. And I'd eat my spinach or whatever, not saying a word, because my diet restrictions are self-imposed, and I can deal. Don't get me wrong, I wouldn't complain about the difficulty of dieting for a bikini competition in the least. Its been a long time since I had such a drive to be this consistent with my diet and fitness goals, and I gotta say, I'm totally into it! But the way I am with diet restrictions... I always know there is a recipe to get around it. On this blog you've seen recipes for all kinds of vegan food, Paleo & gluten-free food, sugar-free desserts, and now! 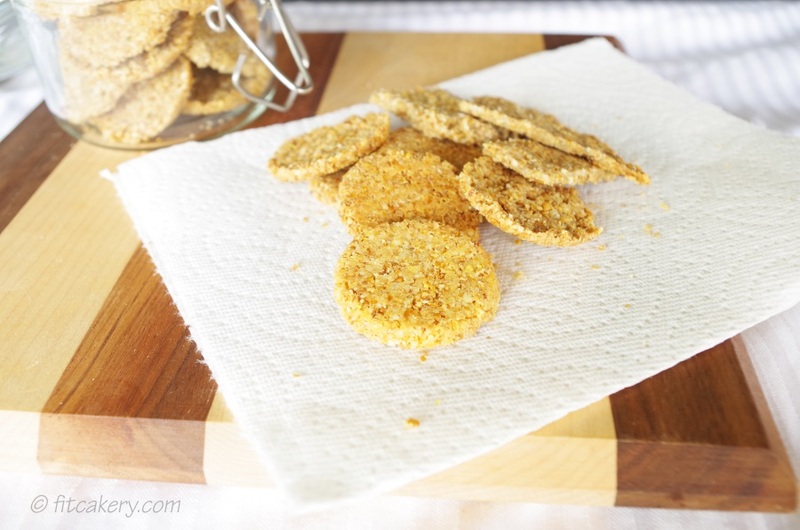 Crunchy, low-carb crackers. With just five simple ingredients, plus any seasonings you deem necessary, these are quicker to make than driving to the store. Well, unless you live next to a store. But that doesn't count. Did I mention yet why these are SUPER-crackers? Check out the ingredients list! It's full of super-foods! And, of course, because they are super-duper tasty. I added a little salt, garlic, and onion powder to my batch - which made them basically addictive. But, you know what... I'll deal! Makes approximately 25-30 crackers per batch. 1/8 - 1/4 tsp. each of any seasonings you like. I used 1/8 tsp. each of garlic and onion powder, but cayenne pepper, Italian herbs, cracked pepper, or so many others could be used to make them taste great! Place all ingredients in a food processor. Process until all the ingredients start to clump together. If they are having a hard time sticking even when pressed between your fingers, add 1 scant T. water. Once you have a dough that resembles graham cracker pie crust, dump the cracker mix into an 8 X 8" pan. Press it down like you would a pie crust, until it all sticks together, and try to make it as flat as possible. You may even want to cover it with a layer of wax paper and roll it with a rolling pin. Alternatively, you can make round crackers by pressing spoonfuls into the bottoms of a mini muffin pan! Bake 7-10 minutes, depending on the thickness, until the crackers have browned slightly and sound crisp when tapped. If you baked the crackers in the square, cut them into squares or rectangles before they cool completely. Enjoy with cheese (do it) or plain (still a good idea)!